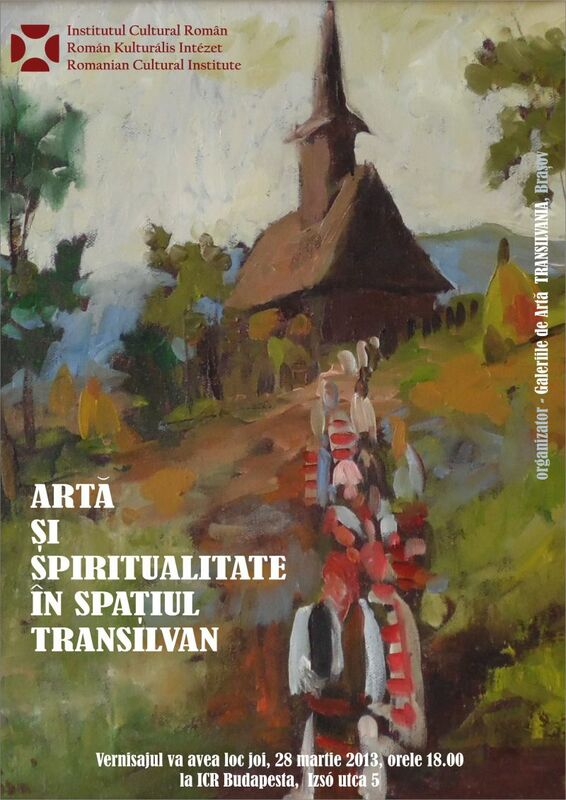 On 28 March, at 18.00, 48 Romanian and Hungarian artists will exhibit their works at the Art and Spirituality Exhibition in the Transylvanian Space, organized by the Romanian Cultural Institute (ICR) in Budapest. The group exhibition will include a number of 48 contemporary artists from Romania and Moldova, graduates of certain universities, members of the UAPR Branches from Bucharest, Brasov, Timisoara, Sibiu, Braila, Neamt, Harghita, Iasi, Cluj, Baia Mare. The authors of the artistic creations exhibited are actively present in the plastic environment through group and personal exhibitions, hosted by the most important national and international galleries, medals at salons and art festivals in the country and abroad. The painting, graphics and sculpture works on the ICR Budapest show a direct atmosphere of the themed approach, an organic and instinctual concept, also approached plastic by each artist in his own, defining style. Through rich means of expression, through various techniques and techniques, the authors have completed creative works of an outstanding artistic quality and compositional craftsmanship. A special presence in the exhibition is represented by Silvia Onisa and Traian Bradean, great masters of contemporary plastic art, who have not been in the past. They were prolific artists and distinguished teachers, who helped to strengthen and develop professionalism in the artistic centers of Baia Mare, Bucharest, but also from across the country. The audience will also admire the works signed by: Elena Agapie, Monica Andriesei, Dumitru Bezem, Veronica Bodea Tatulea, Dana Catona, Ovidiu Carpusor, Mihai Cotovanu, Aurel Dan, Doina Liliana Danescu, Daniel Craciun, Petre Diaconu, Laurentiu Dimisca, Vioara Dinu, Virgil Dobarta, Agnes Domokos, Dorina Dutkay, Mihai Falcoianu, Agnes Ferentz, Georgiana Gamalie, Petre Ghergu, Georgeta Grabovschi, Veronica Iftodi, Constantin Ilea, Robert Ixari, Kovacs Geza, Rozinecs Laszlo, Dana Maria Mark, Yanos Miclos, Laurentiu Midviki, Gheorghe Mosorescu, Aurel Nedel, Stefania Nistoreanu, Stela Onut, Valeria Petriu, Cristian Radu, Ion Radu, Marcela Radulescu, Daniel Stancu, Elena Surdu Stanescu, Rodica Strugaru, Dana Szentkiraly, Cornel Vana. This exceptional exhibition brought to Budapest by "Transilvania" Art Galleries in Brasov, with the financial support of ICR Bucharest, will be opened at the ICR Budapest headquarters from 28 March to 29 April 2013. Good post.want to visit here for more updates.outstanding work.